Bretonnian armies come in many shapes and sizes. They are always grand in their appearance and terrible on the attack. The following pages provide a deep insight into how great Bretonnian armies are made up, and how life is in Bretonnia. To submit Articles, use the Link in your User Menu, and follow the directions there. A collection of maps from Cartographers around the Warhammer World. Bretonnian armies come in many shapes and sizes. They are always grand in their appearance and terrible on the attack. The following articles provide a deep insight into how great Bretonnian armies are made up. 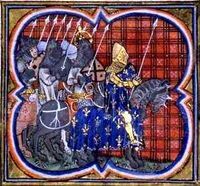 A series of Articles regarding Frankish History.